Our day started off with a beautiful Moroccan breakfast on our hotel’s rooftop with fresh orange juice, omelettes, coupled with a soft Mediterranean breeze. As the new week begins tomorrow, Sunday was a day of working on our research topics for interviews scheduled for the week in Rabat, Tangiers, and Fes. I went over questions for my first interview at our cafe, while also learning Moroccan Arabic phrases from the server. The Moroccan dialect has proved to be very different from Modern Standard Arabic, so I try to practice as much as I can around the city! For lunch, Kairavi and I met with our Tufts friend and Arabic classmate Miranda, who is studying abroad in Rabat for the semester. We listened to her study abroad experiences here. Later in the day, I joined Esra and Reed for an interview with Ms. Courtney Erwin about religion, Sufism, and politics in Morocco. Ms. Erwin is a specialist in international and comparative law, with expertise in international human rights and Islamic law. She has over a decade of experience working internationally with religious, political, legal, and civil society actors, in addition to UN agencies, multi-lateral organizations, and foreign governments. In 2014, she moved from Qatar to Morocco to work as Senior Program Specialist at the Mohamedian League of Religious Scholars (al rabita al muhammadiyya lil 'ulama'), which provides intellectual Islamic leadership through a network of twenty research centers throughout the country. In this role, she assists the Secretary General with research on special projects related to Islamic thought and leadership. In addition, she consults with international organizations, including, the United Nations Office of the High Commissioner for Human Rights, with whom she conducted field visits to local communities in Palestine, Egypt, and Tunisia in relation to a study on the right to education. During our three-hour interview, she shared her experiences and knowledge on Sufism, domestic politics, public opinion, and the religious identities of Morocco with us. Uzair conducted an interview with Professor Mohammed Ftouhi. Mohamed Ftouhi is Professor of Higher Education at Mohamed V University of Rabat (Geography and Education for the Environment and Sustainable Development), serves on the municipal council and is president of the Environment and Urbanism Commission. Mohamed is coordinator of the team Research Group in Education and Communication related to Population, Environment and Development (GRECPED), Faculty of Education Sciences. He has also contributed to many projects around environmental education and development and is president of the Association “Moroccan Club for Environment and Development.” They discussed the water sector in Morocco and how to resolve those issues based on knowledge, experience and expertise. In the afternoon, Aly and Eran visited Villa des Arts, a mansion converted into an exhibition hall, for their research on Moroccan art and culture. The Villa des Arts in Rabat is the result of corporate sponsorship through a foundation of the ONA Group. The latter (Omnium North Africain) is the first Moroccan private industrial and financial group formed as a holding company. The Rabat Villa des Arts is a place of discovery and promotion of contemporary arts with a permanent reference to Moroccan culture and heritage. The others visited the Chellah ruins, a historic town built by Romans in 1st century AD that was later repurposed as a necropolis complex by the Almohad dynasty. 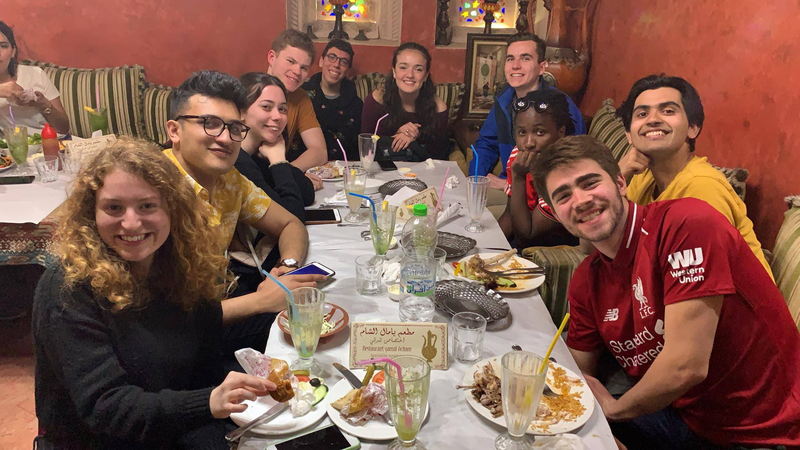 As we spent our second full day in the trip, we got to know more of Morocco’s capital and invested ourselves in our research topics.